CD 8: Beethoven: Piano Sonatas Nos.28 & 29 "Hammerklavier"
CD 23: Beethoven: Piano Sonatas Nos.17 "The Tempest", 21 "Waldstein", 25 & 26 "Les Adieux"
CD 35: Beethoven: Piano Sonatas Nos.11, 12 & 21 "Waldstein"
. . . [the takeaway from Pollini's recordings is] staggering yet mindful virtuosity, intellectual rigor and uncompromising musicianship . . . a live 1974 Prokofiev Third Concerto with Maxim Shostakovich conducting the NHK Symphony Orchestra appears for the first time, and preserves a terrific performance . . . plus Bruno Monsaingeon's excellent 2015 documentary about the pianist . . . You'll never hear the two Luigi Nono works ("Como una ola de fuerza y luz" and ". . . sofferte onde serene . . .") played better . . . Pollini's fusion of power and poetry in the Brahms First Concerto with Karl Böhm always held its own . . . while the Brahms Piano Quintet collaboration with the Quartetto Italiano defines the old adage "opposites attract" in an unexpected and rewarding meeting of minds . . . [Pollini's late Schubert are] among this pianist's warmest, most communicative and lyrically inspired recordings . . . [his recordings of Beethoven's 32 sonatas] are remarkably consistent in regard to technical aplomb, stylish intelligence, seriousness of purpose and airtight structures . . . At 67, Pollini's brash, uninhibited finger work in the three Op. 2 sonatas provides a fascinatingly humane spin upon the 30-something pianist's loftier, laser-like perfection in Op. 111's chains of trills, Op. 101's treacherous leaps, and Op. 106's daunting fugal writing . . . there's no questioning Pollini's high level of achievement, his reputation for greatness, and that his best recordings are here to stay. An inspiring, intellectual performer . . . Pollini has throughout his long career shown an exceptional grasp of complex musical structures, championing the piano repertoire's most ambitious and substantial works . . . Pollini's rhythmic acuity and fearsome accuracy, along with luscious tone and sensitivity in such works as Chopin's Études and Piano Concerto No 1 in E minor, seemed too good to last . . . Few modern pianists have so clearly given the impression of meditating personal or historical tragedies through performances of Beethoven's late sonatas, or combined passionate force and delicacy in Mozart concertos. Pollini also has a preternatural grasp of structured ballets, as in Stravinsky's Three Movements from "Petrushka". In such works he expresses rhythmic focus and detail with improbable exactitude, like a supreme dancer able to negotiate daunting choreography with aplomb . . . Pollini surveys the world and its music from a solitary peak.
. . . superb . . . let me start by celebrating greatness. No more precise or fiercely articulate performance of Stravinsky's "Petrushka" Movements exists, with every thorny challenge surmounted with an ease bordering on nonchalance. And then there's his newly released performance of Prokofiev's Third Concerto -- the most glittering of all . . . [and] Pollini's incomparable skill in the music of Boulez, Stockhausen and Nono . . . who else has played the Polonaises with a less wilting, more arresting authority? Few musicians have shown a more single-minded integrity. Exploring his art once more in this wealth of recordings opens up new perspectives whether in the well-tried and familiar, in his take on jealously guarded assumptions and traditions . . . his prodigious command is undeniable. He remains an extraordinary and unique figure. 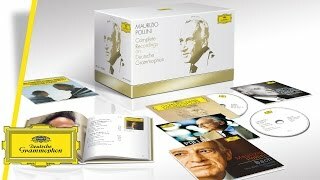 Celebrating his 75th birthday in 2017, this 55CD set presents Maurizio Pollini’s complete recordings on Deutsche Grammophon with their original covers, including the first ever release of Prokofiev’s Third Piano Concerto with the NHK Symphony Orchestra under Maxim Shostakovich (recorded in Tokyo in 1974). Also included are 3 bonus DVDs.